Ms. Thahiya from East Africa was suddenly found a lump on the left breast in June 2012 and then was diagnosed as left ductal breast cancer in local hospital. Without any anticancer treatment, the breast lump was growing bigger and bigger in three months. She and her family members were very anxious about this situation and decided to go to Modern Cancer Hospital Guangzhou for treatment. The pathogenetic condition of Ms. Thahiya has been under good controlled and her physical condition has improved by a series of treatment. 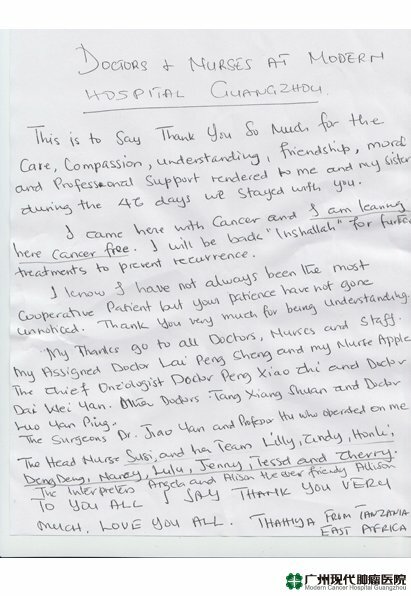 Ms. Thahiya specially wrote this thank-you letter to express her gratitude in view of the meticulous care she and her sister received in Modern Cancer Hospital Guangzhou. This is to say thank you so much for the care, compassion, understanding, friendship, work and professional support rendered to me and my sister during the 46 days we stayed with you. I came here with cancer and I am leaning here cancer free. I will be back for further treatments to prevent recurrence. I know I have not always been the most cooperative patient but your patience have not gone, thank you so much for being understanding. My thanks go to all doctors, nurses and staff; my assigned doctor Lai Peisheng and my nurse Apple; the Chief Oncologist Doctor Peng Xiaochi and Doctor Dai Weiyan; the Doctor Tang Xiangzhuan and Doctor Luo Yanping; the surgeon Dr. Jiao Yan and professor Hu who operated on me; the head nurse Susi and her team Lilly, Andy, Honli, Dengdeng, Nancy, Lulu, Jenny, Tessd amd Cherry; the interpreters Angela and the every friendly Allison. To you all I said thank you very much. Love you all.